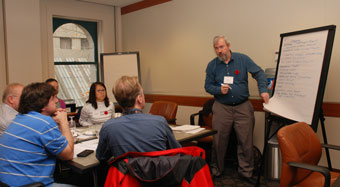 FBC's Steve Litke (right) in a breakout session at the Flood Hazards and Infrastructure Risk in the Lower Mainland workshop on November 5. This was an opportunity for managers from a number of key infrastructure agencies to discuss flood vulnerabilities and opportunities for flood risk reduction in the Lower Mainland. See Resources for agenda and slide decks. The Lower Mainland Flood Management Strategy (LMFMS) is aimed at reducing flood risk and improving the flood resilience of communities along BC's lower Fraser River and south coast — from Hope to Richmond and from Squamish to White Rock. Participants in the LMFMS have responsibilities or interests related to flood management and include the Government of Canada, the Province of British Columbia, Lower Mainland local governments, First Nations and non-governmental and private sector entities in the region. The LMFMS is an opportunity for decison-makers to work collaboratively on flood management. Participants share information, fill knowledge gaps, enhance communications, build consensus, identify regional priorities and inter-dependencies, identify and advance projects of regional benefit and explore cost-sharing solutions. Collaboration is important since a regional consensus on a flood management strategy can identify shared solutions and a compelling case for action at all levels. Phase 1 of the LMFMS (2014-2016) was focused on an analysis of BC Lower Mainland flood scenarios, a regional assessment of flood vulnerabilities and a review of flood protection works and practices in the region. Phase 2 is focused on developing a long-term strategy. Work is underway (2017-2020). Phase 3 is focused on implementation of the Strategy (2020-). The Fraser Basin Council is program manager and facilitator of the Lower Mainland Flood Management Strategy initiative. Questions or comments? Contact Steve Litke, Senior Program Manager at the Fraser Basin Council. 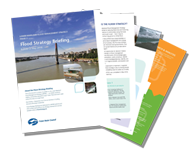 Watch for our next Flood Strategy Briefing, which will be distributed to all Strategy partners in January and posted online. Anyone interested is welcome to subscribe. The Lower Mainland Flood Management Strategy benefits from the participation and support of many. Funding partners in the initiative (2014 -) include the following entities.